As a youngster growing up in the High Plains, specifically northeastern Colorado, there was no barrel racing as part of the annual local rodeos, or kid’s horse competitions during the 1940s. I saw my grandfather take my horse through the barrel racing paces at the local fair in the late 1940s. As I remember it, he loped my buckskin mare along at an unhurried pace. Not at all what we see when we watch the fast and furious event in today’s rodeo arena. My curiosity got the best of me. Where did the sport of barrel racing begin and when? My first contacts were women who were active in rodeo as early as possible, such as Faye Blackstone of Parrish, Florida; Dixie Reger Mosley of Amarillo, Texas; and Wanda Harper Bush of Mason, Texas. Faye began her trick riding career in the 1930s, but when specialty acts began being replaced Faye turned her great horsemanship talents to barrel racing. She and a few other cowgirls began the barrel racing event in Florida in 1950. Dixie Reger Mosley began her rodeo career at age 5 ½ years old, trick riding on a Shetland pony. Growing up in a rodeo family gave her many varied opportunities, including some rodeo clowning. When the Girl’s Rodeo Association (GRA) began in 1948, which turned in to the Women’s Professional Rodeo Association (WPRA) in 1981, Dixie was the bullfighter, rodeo clown, and competed in most events, except bull riding. She saw barrel racing evolve through the GRA organization to become an event for women that today offers purses that compete with the Professional Rodeo Cowboy’s Association (PRCA) event purses. Wanda Bush won her first Barrel Racing World Championship in 1952, and followed this top honor with numerous additional World Championships throughout her rodeo career. Barrel racing was first seen in Texas, according to Faye Blackstone, and spread from there. Although women had been competing in rodeo, in various ways, since the 1880s, when Buffalo Bill Cody, hired Annie Oakley, the best known woman gun handler of the day. Cody discovered that fans would flock to his wild west shows to see her perform. But the decision to include women bronc riders, relay race riders, and so on, was always at the discretion of the men producing the event. The 1931 Stamford, Texas, Cowboy Reunion, a weekend rodeo, decided to add girls, sixteen years and older, that were sponsored by area businesses and represented the community from which they came. The girls would lead the parade, participate in various minor rodeo activities and be available to visit and dance with the cowboys at the social events held each evening. The following year the young ladies were given prizes for (1) the best mount, (2) most attractive riding outfit, and (3) best horsemanship. The horsemanship was demonstrated by riding in a figure eight around barrels. In 1935 the Stamford event changed the barrel racing to a cloverleaf pattern, but it was not judged strictly by the shortest time until 1949. The Cowboys Amateur Association (CAA) organized in 1940, and held rodeos where the contestant could compete on the amateur level until they had won $500. They could then join the ‘professional’ rodeo organization, should they choose to do so. The CAA held competitions for women, as well as men, which included barrel racing, cutting horse contests, bronc riding and a roping event. They also offered money as prizes instead of feminine gifts, such as make-up cases and hair products, which were the general prizes offered previously. There was a flurry of “all girl rodeos” during World War II. They were highly successful, but when the war was over and the men came home things went back to the way they had been before the war, that meant few rodeo competitions for women. Pendleton RoundUp has the most non-conforming and the largest barrel racing pattern in the country, by far. It covers more than double the Standard. The Pendleton RoundUp, which began almost one hundred years ago, has a grass infield. The grass is difficult for horses, both roping horses and broncs, because of the slippage. However the grass is a tradition and Pendleton has no intention of changing it. Professional barrel racers wanted to participate in this prestigious rodeo, but did not want to jeopardize the safety of their horses because of the grass. It was decided to place the barrels on the race track, which surrounds the grass infield in 1999. Since the pattern is more than twice the size of the Standard pattern, 288 feet between barrel one and two, and 288 feet between the second and third barrel, and sixty feet from the score line. Times are in the twenty-eight second range to win. Barrel racing requires the rider and the horse to compete as one. The horse the rider chooses is extremely important in this event. It must be fast and have the ability to make turns around the barrels with the utmost precision and speed. “The main thing necessary when looking for the right horse, to perform as a top ranked barrel racing mount, is a huge heart, a good mind, and a love of barrel racing,” said Angie Clark, well-known barrel racer, barrel racing teacher and organizer of the Wrangler Heartland Barrel Racing Tour, which consists of eleven competitions held in Arkansas, Oklahoma and Missouri. Another needed qualification of the horse is the ability to have the stamina and be able to hold up while being hauled miles and miles to each barrel racing venue. Trailering a horse for fourteen or more hours to get to an event is not unusual. When this is done day after day it can be grueling on a horse. Clark also said, “It is the only sport I know of that a person could ‘buy themselves into’. If a fairly good rider had enough money, like $150,000, to spend on a top-flight, well-trained horse, she could probably beat everyone.” The entire event is usually over in a matter of a quarter of a minute, on a Standard pattern in today’s professional competitions. The shortest times at the National Finals Rodeo has been in the thirteen second area. Brandie Hall ran the course in the 8th Round at the 2006 National Finals in a record-breaking 13.52 seconds. Mildred Farris, barrel racing pioneer, whose competitive years spanned the 1950s until 1971, and was a Girl’s Rodeo Association director, vice-president and president from 1965 to 1971, remembers the days when she and others in her era were trying to get barrel racing included at rodeos across the country. “I worked for the rodeo producer, Tommy Steiner, as a rodeo secretary and he always had barrel races at his rodeos. I think that the barrel racing event, in the beginning, often took the place of contract acts, that had been such an important part of rodeos in earlier days. The girls in the barrel racing event, in our day, always wore more colorful, flashy clothes, much like the contract performers. Steiner was the first producer to use the electric eye in timing the barrel racing event. It must have been in the 1960s,” Farris recalled. She also said that in those days the prizes for barrel racing were not comparable to the men’s events. If the men’s bronc riding or roping paid $400 to win, the barrel racing paid around $100 to the winner. She is quite proud to say that in today’s rodeo the WPRA-sanctioned barrel racing events pay comparable monies to the PRCA-sanctioned events, such as bronc riding, roping competitions, etc. Farris reminisced about her first barrel racing horse. She bought a ‘spoiled’ roping horse. He was ‘high-headed’ and it was impossible to use a tie down on him. But when he started running he would put his head down and he handled well. “The first barrel race I entered with him was an amateur rodeo and I had only run him a few times. At the last minute they decided to change the pattern and run to the first barrel, then to the third barrel, (the farthest away), and back to the second barrel. In spite of the fact he’d not run this pattern before we finished second. That night I practiced this new pattern with him and the second performance we finished first.” Farris was one of the top fifteen barrel racers in the United States for twelve years, 1958 through 1970, only missing 1965. She was also voted Rodeo Secretary of the Year by PRCA nine times, with the most recent honor given to her in 2006. 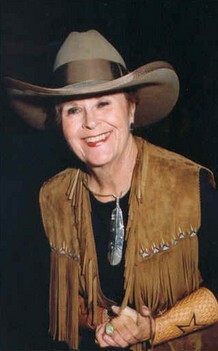 She was inducted, with husband, John, in to the ProRodeo Hall of Fame in 2006. Charmayne James has been the most consistent winner of the World Champion Barrel Racer, with eleven titles between 1984 and 2002. She has also won the average at the National Finals Rodeo seven times. Her horse, Scamper, was inducted in to the ProRodeo Hall of Fame, and has been chosen as The Horse With the Most Heart by WPRA six years. Her accomplishments in barrel racing have surpassed any other competitor to date. She also leads the list of Career Earnings in WPRA, with almost two million dollars. The recent announcement of 29 year old Scamper’s twin, by way of cloning, born August 8, and named Clayton, after her home town, is James way of attempting to continue Scamper’s exceptional genetics in barrel racing. James anxiously waits to see the results. Barrel racing has come a long way in a relatively short period of time when reviewing the development of rodeo. In less than sixty years the sport can boast prizes equal to all other rodeo events. Springing from a beginning as a way of judging young ladies in a contest emphasizing their beauty, attire and horsemanship, to a sport that can require the rider and their special mount, to race against the clock with speed and agility around those barrels and across that final barrier. The horses have staying power and a heart as big as Texas, and the barrel racers today are goal oriented, hard working achievers that think nothing of getting ‘down and dirty’ to prepare themselves and their horse for competition, then entering the arena to perform with grace and determination to have the fastest time. But this didn’t happen without the hard work, tenacity and ‘never say die’ will of many who were convinced the sport of barrel racing had a place along side bronc riding, steer wrestling and the roping events. And it came to be!